The 30-year swap spread is off it's lows but strangely continues to stay negative. 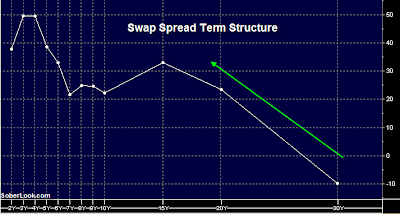 Swap spread is the difference between the treasury yield and the interest rate swap rate (the fixed rate on a new swap) for a particular maturity. With pension liabilities stretching out to 30-years and beyond, a 30-year swap was a good way to convert to floating. Speculations abound that some pensions, concerned about falling rates (which will make the NPV of their liabilities higher) put on new swaps. They could have also bought the 30-year bond to achieve their goal, but many were trying to preserve their liquidity, focusing instead on swaps. The demand to receive fixed on the 30-year swap became so strong that swap rates fell below the corresponding treasury yields. It's a technical market dislocation, but what does it mean fundamentally? It says that somehow one gets paid more over 30 years taking US government risk vs. getting paid a fixed rate equivalent of LIBOR - which is essentially an average bank risk. This is clearly absurd, given that a default in treasury bonds will wipe out the banking system. The question becomes then, given the fundamental mispricing, why hasn't the market taken this negative spread out? Conspiracy theories abound, but let's take a look at the way one would take advantage of such arbitrage opportunity. The way to do it would be to buy the bond on repo (leverage by borrowing the bulk of the bond value using the bond as collateral), and simultaneously put on the corresponding interest rate swap. The buyer pays interest on the repo and fixed rate on the swap, while receiving coupon on the bond and LIBOR on the swap (and has to post some margin on the swap). Seems like this trade should work. The risk however is that the spread could become even more negative and a margin call could force the bond buyer to put up more capital or unwind. But what could cause another such spread move into the negative territory? Possibly another dealer default? It's unlikely we will see another dealer go down in the near future (given all the government support), but this could be a fairly long-term trade. A rumor is enough to get the dreaded margin call. Which may force others who have this trade to unwind it, making the spread go more negative. The trade may just not have enough juice in to to make it worth while, given the risks. To make this work also requires doing it in size. This mispricing shows that as much as we may think the markets are back to normal, the long-term view remains shaky. Risks that two years ago were thought to be ridiculous, may now seem real enough to prevent managers from taking out this arbitrage opportunity.